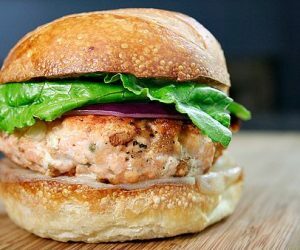 The next time you’re craving a fatty fast food burger, give these salmon patties a whirl instead. The fat in salmon is largely in the form of heart-healthy omega-3s. Plus, salmon is a great source of folate, vitamin B12, niacin, thiamin, and riboflavin. 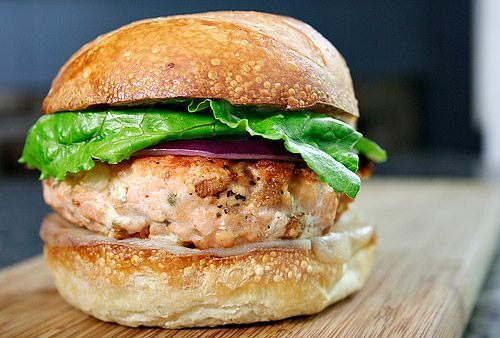 But you won’t be thinking of how healthy salmon is when you eat it — you’ll be too busy savoring every bite of your juicy, flavorful burger! 1. In a med. bowl, gently mix salmon, egg, bread crumbs, mayonnaise, and onions. Form into four patties. 2. Coat a lg. nonstick skillet with cooking spray and place over med-high heat until hot. Add patties. Cook three min. Turn and cook three to five min. or until patties are firm and golden brown. 3. Garnish with lettuce, tomato and sliced onion. Per Serving: 226 cal., 8.5 g. (34% of cal) fat, 1.1 g sat. fat, 78 mg chol., 1.1 g fiber, 19.3 g protein, 18.4 g carb, 265 mg sodium.